You've probably heard the long-standing wisdom that you should drink 64 ounces—that's eight, eight-ounce glasses—every day, no matter what. But the truth might be a little more complicated. Since hydration needs can vary tremendously based on your body type or your physical activity level, just to name a few, many nutritionists believe it is better advice to drink half of your bodyweight—in pounds—in ounces of water. Though it sounds complicated, we promise the math is easy! Let's break down a simple example. Say you weigh 200 pounds. Simply divide that number by half, and you'll see that you should be drinking 100 ounces of water a day—significantly more than the recommended 64-ounce amount. What's nice about this approach is it's more individualized, which is important for those in higher weight ranges who may have larger hydration needs than someone sitting just slightly above 100 pounds. However, there are even more factors to consider if you are physically active or live in an extremely hot or dry climate. 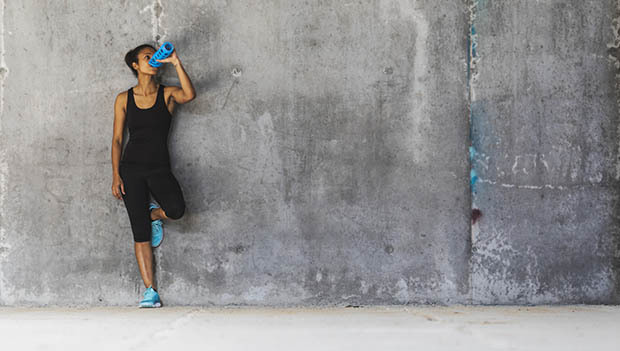 In these scenarios, it's important to tune into your thirst cues and remember to hydrate both before, during and after any rigorous exercise. Note that the specifics can vary greatly based on type of exercise, length of exercise, height, weight and even gender. Another important way to stay in-touch with your hydration needs is to pay attention to the color of your urine. It should be light yellow or almost clear; dark yellow or brown urine can indicate you're not drinking enough water. Though it's rare, you can drink too much water. This is known as hyponatremia or when sodium levels in your body become dangerously low. Sodium is an electrolyte and regulates the amount of water that's in and around your cells. If you drink too much water, you can severely dilute the sodium in the same way that adding more water to a soup makes it less salty. As your body's water level rises and sodium diminishes, your cells will begin to swell; this condition can be life-threatening. Because you lose sodium when you sweat, this is a major concern in the endurance community, where marathoners and triathletes will train for hours under rigorous conditions. This is why hydrating with electrolyte-infused sports drinks, powders or snacks is crucial for maintaining the proper sodium levels in the body. If you are concerned about artificial ingredients or sugar found within certain products, you can simply add a teaspoon of sea salt to your water bottle. Whatever your approach, it's important not to forget proper electrolyte replenishment in addition to hydration. (watermelon, tomatoes, oranges) can count toward your hydration needs. Invest in a reusable water bottle that you can take on-the-go to continue hydrating. A "smart" bottle or bottle that encourages you to drink around the clock can be especially helpful. Log your hydration until you get used to the amount you should be drinking each day; this can be done on paper or on a mobile app. Establish daily routines to remind you to drink. Examples include: Drinking a glass right after you wake up, drinking a glass before and after every meal, taking a few sips after every bathroom break, etc. Don't be afraid to infuse or carbonate your water if that encourages you to drink more; however, try to stay away from sugar-heavy ingredients or formulations.